Q. I’m not a business user, but just have a home computer that’s gone wrong. Are you interested? A. Yes! If you’ve got a computer problem and need help, we’ll help. Q. Do you really only charge a £49 flat rate no-fix no fee? A. Yes. The service charge is just £49. The only extra cost will be for parts if required. Q. Will I have to pay a call-out fee if it’s not possible to repair my computer? Q. My wireless isn’t functioning. Will I pay extra if you set it up? Q. How much do you charge to clean viruses from my laptop/PC? A. Just £49. 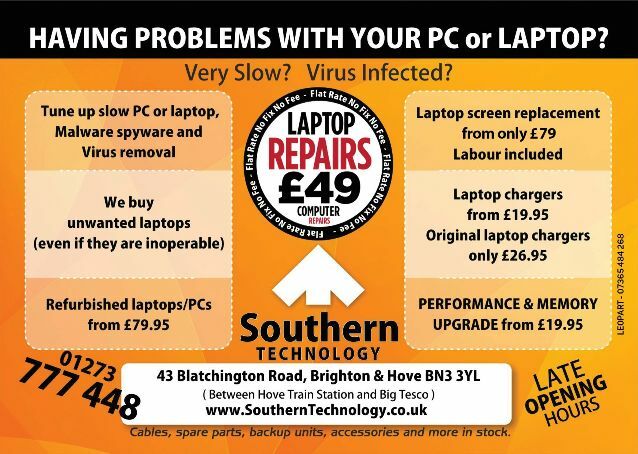 Drop of your laptop or PC to us and we’ll get it cleaned up and running. Q. Do I have to pay extra if the job takes longer than expected? A. No. Our £49 flat fee still applies. Q. Will you collect my laptop or desktop PC rather than fixing it at my premises? Q. Do you charge extra for picking up and returning my computer? Q. I’m at work during the day. Can you call in the evenings? Q. Can you upgrade my computer and add the spare part I need? Q. I’ve just got a new computer and arranged broadband. Will you set it up? Q. Do you always need to visit, or can you give me advice on the phone? Q. I’ve just got a new computer but I’m not really sure how to use it. Can you help? Q. I seem to have lost everything on my computer. Can you help? A. Yes. Lost data can be a stressful event for home and business users. We can provide data recovery at competitive prices – and advise on back-up solutions. Q. My printer’s packed up. Can you sort it out for me? A. Yes. We fix all computer, software, printer ( not hardware, only settings, connections etc ) problems. Q. My computer just won’t start. Can I bring it in to your workshop? Q. My computer’s got really slow! Can you fix it? A. A very familiar question! We’ll do what’s necessary to speed things up! * We normally repair laptops and computers in our shop, we prefer this way as we keep our costs down, and to keep the service charge as low as possible and also keep variety of spare parts in our shop to speed up the repair. If agreed in advanced, we can visit you out of working hours, like after closing the shop 6:30 PM or 7:00 PM, or later. For details please contact us.